Moodle is a popular and open-source web-based learning management system (LMS) that is free for anyone to install and use. With Moodle, you can create and deliver learning resources such as courses, readings, and discussion boards to groups of learners. Moodle also allows you to manage user roles, so students and instructors can have different levels of access to materials. Once you install Moodle on your web server, anyone with access to your site can create and participate in browser-based learning. In this guide, you will install and set up Moodle on your Ubuntu 16.04 server. You'll install and configure all the software required by Moodle, run through the setup wizard, choose a theme, and create your first course. A 1GB Ubuntu 16.04 server with a minimum of 200MB of disk space for the Moodle code and as much as you need to store your content. Moodle requires 512MB of memory, but recommends at least 1GB for best performance. A non-root user with sudo privileges and a firewall, which you can set up by following the Ubuntu 16.04 initial server setup guide. The LAMP stack (Apache, MySQL, and PHP) installed by following this tutorial. Be sure to make a note of the root MySQL password you set during this process. 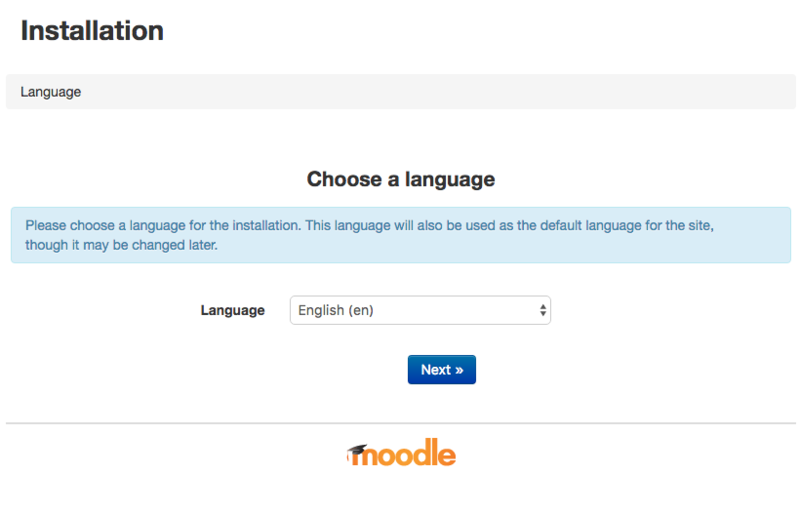 Now we are ready to download and install Moodle itself. We’ll use curl to download Moodle from the official distribution server. The following command will go to the Moodle website and get the compressed package that contains the entire current, stable version of Moodle into the file moodle.tgz. The -L flag tells curl to follow redirects. Now that you’ve got Moodle on your server, it’s time to set up the database it'll use. We need to create the MySQL database where Moodle will store most of its data. We'll create the structure that the Moodle code expects, and we'll create a user that Moodle will use to connect to the database. Save this file and then restart the MySQL server to reload the configuration with the new settings. When prompted, supply the root password you set when you installed MySQL. Note: In the next two commands, replace moodler with your Moodle username and moodlerpassword with a chosen password. That takes care of the database configuration. Now we can launch Moodle in a browser and continue the setup there. To finish configuring Moodle, we'll bring up the site in a web browser and provide it with some additional configuration details. In order for the web server to save the configuration, we need to temporarily alter the permission for the Moodle web root. The permissions open this folder up to everyone. If you are uncomfortable with doing this, simply don't change the permission. The web interface will provide instructions for you to manually modify the configuration file. If you do change the permissions, it is very important to undo this as soon as you have completed the setup. That step is included in this tutorial. Now open up a browser and go to http://your_server_ip/moodle. You’ll see a page like the following. Set the language you want to use and click Next. On the next screen, set the Data Directory to /var/moodledata and click Next. On the the Choose Database Driver page, set Database driver to Improved MySQL (native mysqli). Then click Next. On the Database setting page, enter the username and password for the Moodle MySQL user you created in Step 3. The other fields can be left as they are. Click Next to continue. Review the license agreement and confirm that you agree to its terms by pressing Continue. Review the Server Checks page for any possible issues. Ensure the message "Your server environment meets all minimum requirements" exists at the bottom and press Continue. Moodle will install several components, displaying "Success" messages for each. Scroll to the bottom and press Continue. You'll then see a page where you can set up your administrator account for Moodle. For Username, enter anything you'd like, ar accept the default. For Choose an authentication method, leave the default value in place. For New password, enter the password you'd like to use. For Email, enter your email address. Set the rest of the fields to appropriate values. On the Front Page Settings screen, fill in the Full site name, the Short name for site, set a location, and select whether you want to allow self-registration via email. Then click Save changes. Once you’ve done this. you’ll be taken to the dashboard of your new Moodle installation, logged in as the admin user. Let's make one more minor change to improve Moodle's security. By default, Moodle creates files in the /var/moodledata folder with world-writeable permissions. Let's tighten that up by changing the default permissions Moodle uses. Now that Moodle is configured, let’s make a few customizations and create a test course to get a feel for the Moodle web interface. Now that your site is running, one of the first things you night want to do is register your Moodle site. This will subscribe you to the Moodle mailing list which will keep you up to date about things like security alerts and new releases. To register, click the Site Administration link in the box on the left, and click on Registration. Then fill out the web form with the appropriate details. You can also choose to publish your Moodle site so others can find it. Click the Change theme button and you’ll be taken to a screen that shows you other available themes. 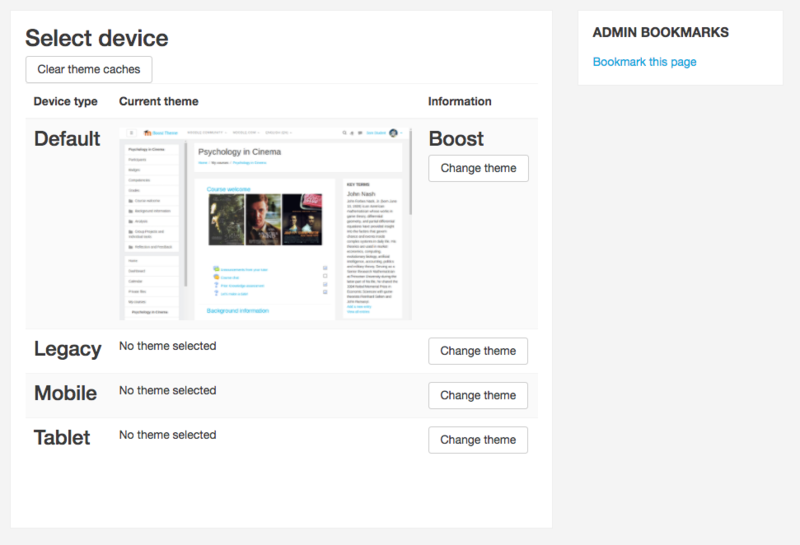 When you click on the Use theme button under a theme name, your Moodle site will use that theme to display all of your site’s content. You can also choose different themes for different devices, like tablets or phones. Fill in the information about your course, including the name, short name, a description, and any other relevant details. Then scroll to the bottom and click Save and display. Your first Moodle course is now ready to go. 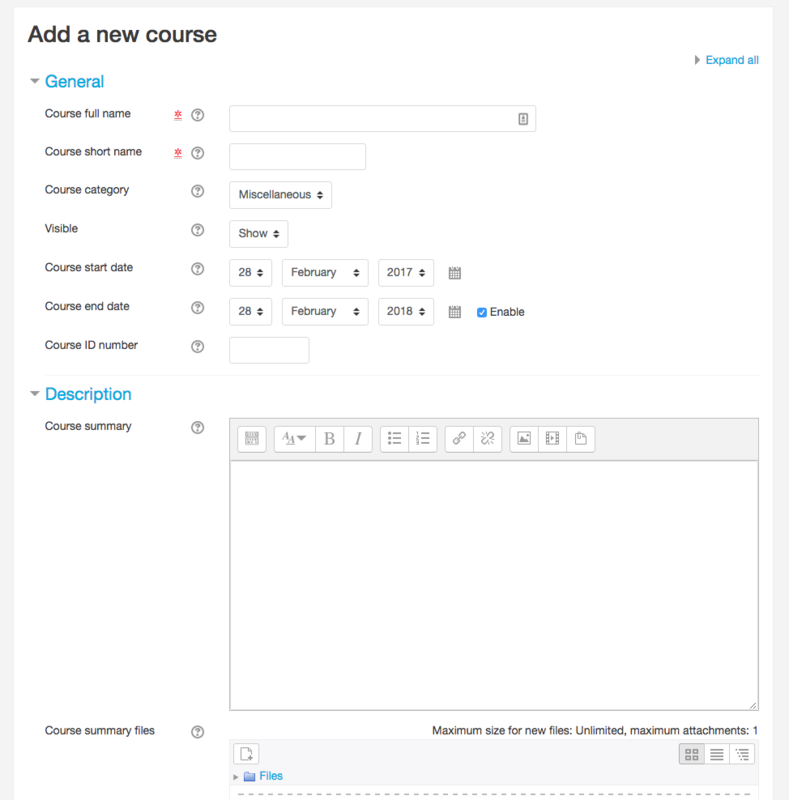 You can start adding lessons and activities to the course using Moodle's interface. But before you start letting people sign up to take your new course, you should ensure your Moodle installation is ready for production. For starters, you'll want to set up a TSL/SSL certificate for Apache to encrypt the traffic between your server and clients. To do that, follow the tutorial How To Secure Apache with Let's Encrypt on Ubuntu 16.04. And to make sure your data is protected, ensure that you back up your MySQL database periodically. You should also back up the files on the server, including the /var/moodledata/ folder. The tutorial How To Choose an Effective Backup Strategy for your VPS offers suggestions for backing up files. In this article you installed and set up Moodle on an Ubuntu 16.04 server. Moodle is a robust and highly configurable web application. Be sure to consult the Moodle documentation and get in touch with the worldwide community of Moodle users and administrators for ideas about how to make the most of it. Happy Moodling!